Mrs. Clinton is a resident of Catoosa County. She lives happily with her husband and two children who attend Catoosa County Schools. 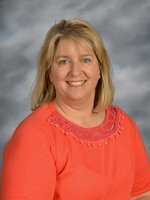 She is in her 25th year of teaching music which includes 15 years in Hamilton County and one year in Monroe County, Tennessee. Mrs. Clinton loves to play the piano and attend church. She attended the University of Tennessee at Chattanooga, graduating in 1991 with a Bachelor of Science degree in music education. Mrs. Clinton has been at Tiger Creek for 10 years and enjoys chorus and all of her students.